The new site has 3,000 square feet for storage in the basement. The restaurant on the first floor has 850 square feet with 12 tables, each with seating for four guests. In the center, a concave ceiling with an island table below will be stacked with food. Waiters will serve diners an entree of a salad and pickles, soup, and a main dish of a protein, a grain, and a vegetable. Dessert and hot drinks would be last. There is a washing station to make a blessing over bread. Alex Rapaport, Executive Director of Masbia Queens, gave the Queens Jewish Link a tour of the new place. There are two separate entrances and addresses: one for the food pantry and one for the restaurant. Next door to Masbia is Super Glatt Kosher Mini Market, which is next to Sushi Fussion, a kosher sushi restaurant. 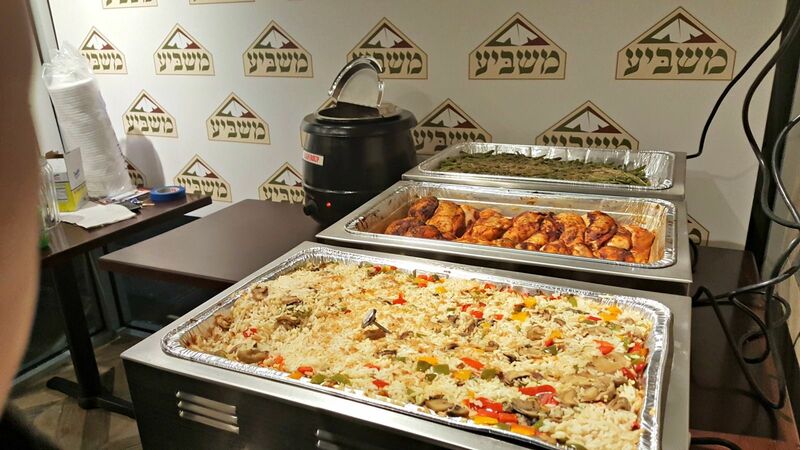 Two mashgichim have been hired to make sure Masbia’s food is glatt kosher. The Q23 and Q38 buses are nearby. Masbia originally opened at 98-08 Queens Boulevard in Rego Park in 2010. At their peak, they were serving 200 sit-in dinners and 600-800 people at their food pantry every week. Fifty percent of their clientele were seniors. Masbia originally had a four-year lease that turned into a 6½-year stay. Masbia continued serving food packages on Thursdays from a trailer after their old site closed in July of 2017. The old site and the adjacent stores have been torn down. Plans there are for an eight-story residential building with 59 new apartments and balconies, 7,000 square feet for medical offices and retail on the street level, and a parking garage for 59 cars, according to the Forest Hills Post newspaper. Mr. Rapaport knew the old site would eventually give way to a new apartment building. He originally wanted to come to 108th Street, but faced resistance from landlords who did not want that kind of service in their neighborhood. At their current location, Masbia had to raise the floor level in the foyer two to three feet to be level with the sidewalk. A handicapped accessible bathroom with room for a wheelchair and toilet handlebars were installed. Two windows were put into the facade. Two addresses, one for the food pantry and one for the restaurant, were registered at the Queens Borough President’s Office. It took Con Edison 18 months to give Masbia its own electric meter. Now, they are waiting for Con Ed to give them a gas meter. The soil was tested, two doors were created, a new slot carved out of the building, and Masbia hired their own exterminator in addition to the landlord’s. Air conditioning and heating units are being installed. Masbia’s annual operating costs, not including construction costs, were $1 million dollars at their peak. It cost $30-$40,000 to raise the foyer to the level of the sidewalk. “Our heroes” when it comes to funding, said Alex Rapaport, are: Itzi Laub, Chairman of the Board for Masbia, Henry Ornstein, creator of the Transformer toys, and Judith Margolis. The Helmsley Foundation, created by Leona Helmsley “has reached out to us in a neighborhood they feel is underserved. They want to help,” said Alex Rapaport of Masbia. The Shulchan Aruch (Code of Jewish Law) and the Mishneh Torah of the Rambam (Maimonides) said one should only serve the best when giving charity, said Alex Rapaport, who is working an 80-hour week. He wants to protect the dignity of each individual, Jewish or not, who comes to Masbia. Food that isn’t of adequate quality will be thrown away. There isn’t a financial screening. People are asked for their cell-phone number so they could receive text alerts when to come to the food pantry. Consumers can also make appointments. People can register for this on the City’s “Plentiful” phone app and look under the food pantry section. Instead of dollars, people will use “Nams” to customize which food products they want to take home. While Masbia has been having an ongoing “soft opening,” there will be a grand opening in the near future. Six volunteers working two-hour shifts will be needed. To volunteer or to donate, call Alex Rapaport at 718-972-4446 (ext. 209) or 866-9-MASBIA, or visit their website (www.masbiaqueens.org).